At a special ceremony in Los Angeles on Thursday, unified middleweight champion Canelo Alvarez received the Middleweight World Title and the Pound-For-Pound Championship Belts. In an eventful week, capped off by the announcement of a massive $365 million dollar signing with the sports streaming site DAZN, and the announcement of a December 15th fight date to challenge Rocky Fielding for the super middleweight title, Canelo thanked God, his team and Ring Magazine. “I want to thank God, my team and my family. I want to thank Golden Boy as well. Having a belt like this is a responsibility, and this is a responsibility that I plan to undertake. Following Canelo’s acceptance of the middleweight and pound-4-pound belts, Ring also recognized Canelo’s trainer, Eddie Reynoso, with a special trainer’s version of the belt named in honor of Efren Torres, a former Ring title holder and descendant of Reynoso’s wife. Thank you very much to Ring Magazine and the family of my wife. One time, in a photo, we saw that he won the Ring title and it’s not [the belt] with the family of my wife. So I asked Ramiro to ask the people at Ring Magazine if he won the title and it was true, against [Chartchai] Chionoi one of the greatest fights. So they gave it to me in the name of me and my wife’s family so I am really grateful. 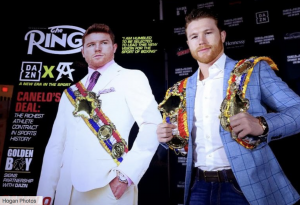 The event concluded with the unveiling of Ring Magazine’s soon to be released latest issue featuring Canelo wearing the Ring Magazine title. Canelo, who currently holds the WBC, WBA and lineal middleweight world titles will move up to 168 pounds to challenge Rocky Fielding for the WBA super middleweight title in a 12-round main event on Saturday, December 15 at Madison Square Garden and streamed Live on DAZN.